Hundreds of domestic workers and day laborers have been displaced from their homes and have lost their livelihoods due to the Sonoma County fires. We are in a critical moment where the organizing and leadership of immigrant workers are key to a Just Recovery. A Just Recovery means that no one is left behind, including immigrant women workers who are the most vulnerable, with few protections and little access to relief, and who at the same time serve as the backbone for their communities. 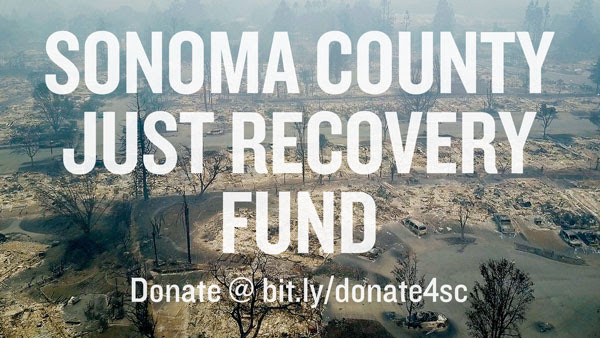 PLEASE MAKE A DONATION of any size to the Sonoma County Just Recovery Fund. The Just Recovery Fund will grow the organizing and training capacity of existing worker organizing with ALMAS (Alianza de Mujeres Activas y Solidarias) and the Graton Day Labor Center to ensure that immigrant families, domestic workers, and reconstruction workers are not forgotten. The Sonoma County Just Recovery Fund will address immediate needs by providing critical information to domestic workers, day laborers, and other members of the worker center and immigrant community. It will support a safe gathering location and distribute life-saving equipment and training about health risks in the aftermath of a fire. Beyond the short term, the Fund will support long-term recovery efforts and grassroots organizing to demand a just recovery where the immigrant workforce is supported instead of exploited. Just Recovery includes demanding high standards of safety and labor protections for all workers who perform recovery work, training workers to defend against labor violations, directing public attention toward immigration defense, and advocating for policies that will protect the community as it rebuilds. A Just Recovery means domestic workers and day laborers are organized and empowered to lead recovery efforts, shaping the future of their own communities. The Sonoma County Just Recovery Fund is a collaboration between Centro Laboral de Graton, the California Domestic Workers Coalition (CDWC), and the National Day Laborer Organizing Network (NDLON), that will provide resources for Sonoma County’s domestic workers and day laborers and advocate for a just recovery process that does not exclude the immigrant community. We need your support now to ensure that not only do domestic workers and day laborers in Sonoma County receive the critical resources they need in the difficult days, weeks, and months ahead but also that their voices are heard and recognized as the region rebuilds and recovers. DONATE TODAY and tell a friend how they can also give to the Fund.